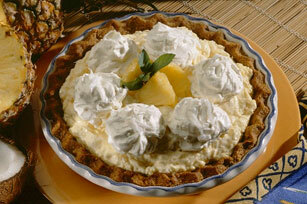 Made with crushed pineapple, this luscious cream pie recipe puts a tropical twist on any dessert buffet. Combine graham crumbs, sugar and butter; press onto bottom and up side of 9-inch pie plate. Bake 8 min. or until lightly browned; cool completely. Beat pudding mixes and milk in medium bowl with whisk 2 min. Stir in 2 cups Cool Whip, then pineapple; spoon into crust. Refrigerate 3 hours or until firm. Top with remaining Cool Whip before serving. Garnish with fresh pineapple chunks and sprigs of fresh mint just before serving.